d i v e r s i t y w o m a n . c o m Fa l l 2 0 1 4 D I V E R S I T Y W O M A N 17 THINKSTOCKPHOTOS Etc. 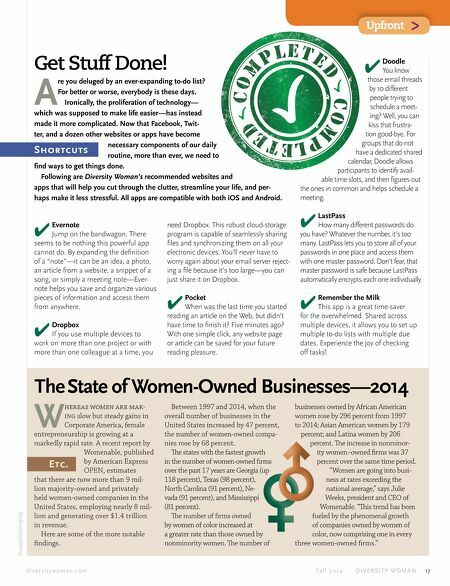 The State of Women-Owned Businesses—2014 Get Stuff Done! Shortcuts Upfront > A re you deluged by an ever-expanding to-do list? For better or worse, everybody is these days. Ironically, the proliferation of technology— which was supposed to make life easier—has instead made it more complicated. Now that Facebook, Twit- ter, and a dozen other websites or apps have become necessary components of our daily routine, more than ever, we need to find ways to get things done. Following are Diversity Woman's recommended websites and apps that will help you cut through the clutter, streamline your life, and per- haps make it less stressful. All apps are compatible with both iOS and Android. W hereas women are mak- ing slow but steady gains in Corporate America, female entrepreneurship is growing at a markedly rapid rate. A recent report by Womenable, published by American Express OPEN, estimates that there are now more than 9 mil- lion majority-owned and privately held women-owned companies in the United States, employing nearly 8 mil- lion and generating over $1.4 trillion in revenue. Here are some of the more notable fndings. Between 1997 and 2014, when the overall number of businesses in the United States increased by 47 percent, the number of women-owned compa- nies rose by 68 percent. Te states with the fastest growth in the number of women-owned frms over the past 17 years are Georgia (up 118 percent), Texas (98 percent), North Carolina (91 percent), Ne- vada (91 percent), and Mississippi (81 percent). Te number of frms owned by women of color increased at a greater rate than those owned by nonminority women. Te number of businesses owned by African American women rose by 296 percent from 1997 to 2014; Asian American women by 179 percent; and Latina women by 206 percent. Te increase in nonminor- ity women–owned frms was 37 percent over the same time period. "Women are going into busi- ness at rates exceeding the national average," says Julie Weeks, president and CEO of Womenable. 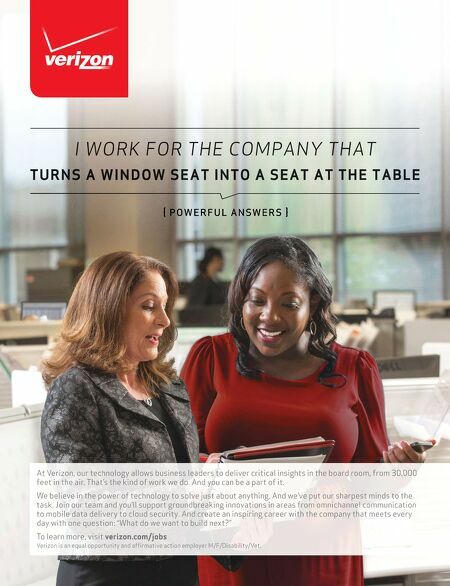 "Tis trend has been fueled by the phenomenal growth of companies owned by women of color, now comprising one in every three women-owned frms." 4 Evernote Jump on the bandwagon. There seems to be nothing this powerful app cannot do. By expanding the defnition of a "note"—it can be an idea, a photo, an article from a website, a snippet of a song, or simply a meeting note—Ever- note helps you save and organize various pieces of information and access them from anywhere. 4 Dropbox If you use multiple devices to work on more than one project or with more than one colleague at a time, you need Dropbox. This robust cloud-storage program is capable of seamlessly sharing fles and synchronizing them on all your electronic devices. You'll never have to worry again about your email server reject- ing a fle because it's too large—you can just share it on Dropbox. 4 Pocket When was the last time you started reading an article on the Web, but didn't have time to fnish it? Five minutes ago? With one simple click, any website page or article can be saved for your future reading pleasure. 4 Doodle You know those email threads by 10 different people trying to schedule a meet- ing? Well, you can kiss that frustra- tion good-bye. For groups that do not have a dedicated shared calendar, Doodle allows participants to identify avail- able time slots, and then fgures out the ones in common and helps schedule a meeting. 4 LastPass How many different passwords do you have? Whatever the number, it's too many. LastPass lets you to store all of your passwords in one place and access them with one master password. Don't fear, that master password is safe because LastPass automatically encrypts each one individually. 4 Remember the Milk This app is a great time-saver for the overwhelmed. Shared across multiple devices, it allows you to set up multiple to-do lists with multiple due dates. Experience the joy of checking off tasks!